Jordan Wolfson, Dreaming of the dream of the dream, 2004-2005. 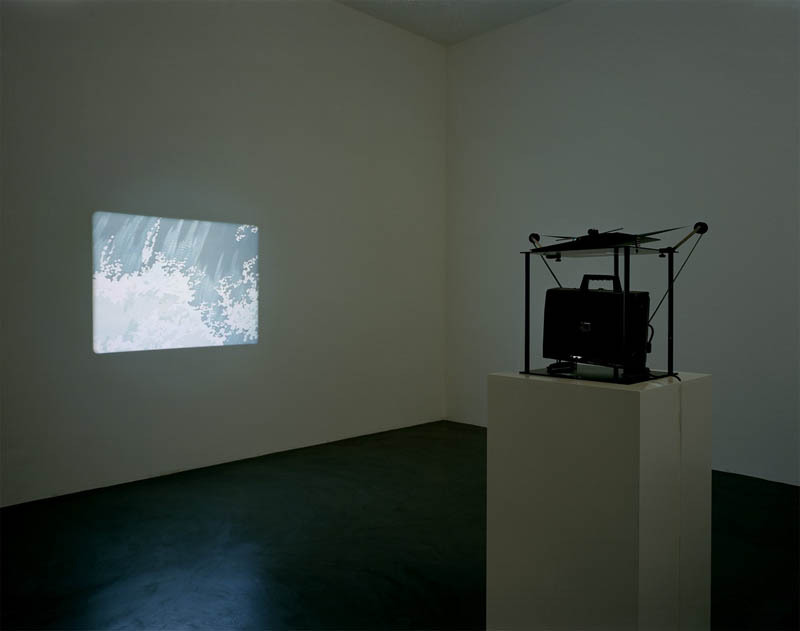 Dreaming of the dream of the dream is a 16mm projection consisting of images of waves that come and go continuously. The artist has assembled extracts of cartoons in which water is visible (the sea, bubbles, a stream, waves, etc.). Somewhat nostalgic, these extracts can recall either childhood cartoons or paintings by Hokusai. The continuous movement of the waves echoes the presentation of the film which also loops: a metaphor of life, a cyclical and continuous movement which nevertheless cannot be altered. The more the film is shown, the more the images become worn. The images progressively disappear with the scratches on the print. In fact, the work itself has a limited lifespan since the artist insists that the film should never be copied and that it should be shown until the images have entirely disappeared. Once the work is ‘dead’, only documentation will remain as in the case of a performance. Even though the images are the same, everyone has a different experience of the work until it erases and self-destructs completely only to remain in our memory. Jordan Wolfson is often defined as a romantic conceptualist indeed his work tends to subvert material conditions of the art world and question contemporary socio-cultural or religious stereotypes with a great deal of highly strung melancholy, humor or cynicism. Between fact and fiction, Wolfson's practice involves film, text and graphics, sound and animations. The poetic forms arrived at are ambiguous, tautological and often anxiously psychological constructs. He scrutinizes popular culture for his pinpointed iconoclastic artworks. Some of his now famous references are to Charlie Chaplin, Michael Jackson, Christopher Reeve, Rodgers and Hammerstein lyrics, Eric Satie'sGymnopédie, the Semite.